Roman's kidnapper (left) alongside an unnamed accomplice during "Roman's Holiday" in The Lost and Damned. Roman's kidnapper, henceforth known as the kidnapper, is a minor character in Grand Theft Auto IV and The Lost and Damned, appearing in the missions "Hostile Negotiation" and "Roman's Holiday", respectively. His name is unknown. His first chronological appearance is during TLAD in the house of Ashley Butler, when he ordered Johnny Klebitz to kidnap Roman Bellic for his debts. Johnny asked him about his name, but kidnapper said that it's 'not important'. He worked for Dimitri Rascalov and, judging by his clever and fearless style of communication with Johnny, he was a high ranking member of Rascalov's gang. 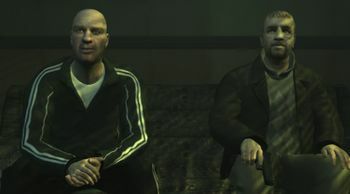 When Johnny brought Roman to a warehouse in Bohan, the kidnapper began abusing Roman so that he would reveal the location of his cousin Niko Bellic, even though Johnny asked the kidnapper go easy on Roman. He also took a photo of Roman and sent it to Dimitri to let him know that the "work" is done. Some time later, Niko began an assault on the warehouse and finally entered a room where the kidnapper had presumably taken Roman. In The Lost and Damned the kidnapper was voiced by Yevgeniy Dekhtyar. This page was last modified on 26 October 2013, at 18:52.